What's better than a hot stack of pancakes at weekend brunch? How about digging into your meal in a killer outfit. One of the best parts of everyone's favorite weekend pastime is the fact that a great outfit is always part of the equation. Whether you're meeting your girlfriends over eggs or you're on a brunch date armed with a mimosa, putting together the perfect casual yet chic outfit makes the best brunch just a little bit sweeter. 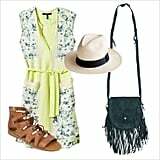 Bold floral prints, daytime heels, and eye-catching accessories are on the menu: everything you need to get the effortlessly stylish outfit you're looking for. 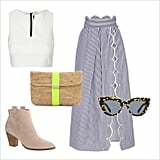 Read on for three outfit ideas that will inspire you to make the most out of your next midday meal, or try one on tonight because flapjacks for dinner is totally OK, right?